UNPROCESSED was formed by guitarist Manuel and drummer Jan in early 2014 together with the earlier bassist, singer and second guitarist. After a few line-up changes, the current members decided on sticking to a highly diversifying sound. 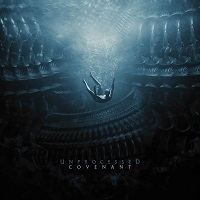 “Covenant” is the band’s second full-length release, and contains ten new tracks. The title track, “Covenant,” leads off the album, in a three-minute mood-setter. Right off the bat, the aggressive rhythmic sound is both vigorous and agile, but not lacking in melody. It segues into “Haven.” Clean vocals in the verses separate from the cadence of the guitars, which shift adeptly underneath, moving in ways that sometimes challenge your sense of timing. Harsh vocals bring an additional edge to what is already a heavy affair. Interwoven melodies dance in and around, tying these elements together into a cohesive and memorable track. There is no lack of musicianship here either. “Ghilan” hits you hard from the opening, with an instrumental carnival of churning chords, notes and polyrhythms. The accents are deep and weighted, but work so very well in the various melodies that come at you from multiple angles. The ending atmospheric sequence sounds like what you might encounter on a deep dive to the bottom of the ocean…peace, bliss, a light in the darkness, and a clear sign of the presence intelligent life lurking. “Malleable” chugs like an ensemble of machines, working together in separate dimensions of space and time, creating something magical that will unify the masses in a promise of all that is good and hopeful in the world. Its alluring brilliance is nearly irresistible. “Millenium,” on the other hand, beings a slow rises out of the depths of blackness. The copious weight of the instruments are matched equally by masterful song crafting that is mysterious and suspenseful at some times, while being charming and supple at others. Clever, savvy, and competent, the expert musicianship displayed here is hard to ignore. “The Division” opens with some heavy firepower and raging vocals. Bright piano/key melodies frolic in the background, covered in an aura of radiance that seem unaffected at the chaos convulsing around them, as Levy’s bass thwacks threateningly. “The Mirror” is sheer, unadulterated beauty, though dark beauty at times. Piano is such a positive medium to express emotions, and the notes combine with pensive and expressive vocals from Fernandes. It has such a yearning sound that just compels you to give in to your fears and transgressions. “Meridian” swings back around to the destructive and pummeling sound, supported in their podium by thoughtful and contemplative harmonies. Madness rages white with hate within the harsh vocals. “Exhale” features AEONS OF CORRUPTION vocalist Vincent Schmitz. It’s one of the most energetic songs on the album, structured as an advance algorithm and really taking advantage of some highly technical mastery in the instruments. Its attack is relentless and it explodes like a bomb and then leaves as quickly as it arrived. “Exeunt” is a short instrumental closer. For me, the eccentric electrical sound highlights the outer-world elements that you can hear running as a thread throughout the album. The album cover touches on the paradox that makes the songs as special as they really are, and invokes imagery that is reflective of what you can expect to hear. A human figure is falling gently into the depths of a body of water, that, in my take, is surrounded by alien structures that have existed for thousands of years, lying dormant and undiscovered. He is not, however, descending to his death, although their imposing features and the ever darkening waters would suggest so. Indeed, what he finds in the blackest of holes of his new existence is an unwavering light, shimmering boundlessly, protecting him from forces of gravity and defying the laws of physics. Introspective, thoughtful and cautious at times, while being merciless and savage at others, “Covenant” displays both masterful musicianship, and transcending Progressive proficiency, in a warm bed of nurturing melodies that is as beautiful as it is deadly.